In February 2017 I ended up in our local A&E (ER) Department as I had turned yellow. The first person I saw was a triage nurse who asked lots of questions about health conditions, history and medication. Next I saw an A&E Registrar. He asked the same questions but what would he have concluded if I hadn’t been able to fill in the details? He would have been confronted with a patient with a large scar up the midline, the hint of a stoma location and an appendectomy incision. He wouldn’t have known why the large scar was there and would have assumed my appendix had been taken out. He would be unaware that : I have Crohn’s disease; the attempt to remove my appendix had been aborted; I have Portal Vein Thrombosis resulting in additional veins growing in my esophagus (varices) and around by gallbladder; that my spleen is enlarged; or that the low platelet count is now normal for me. Valuable time could have been lost trying to investigate the problems that were already known about and being treated. As a result of my A&E visit I wondered if there was a standard, minimum set of data that should be available? Was there a standard format for the data? I searched the internet and could find nothing. A good starting point would therefore be the questions the triage nurse had asked – personal details; current medication; current medical conditions; and any known allergies. There are, of course, the likes of SOS Talisman bracelets which have some very basic information engraved on, or contained within, them. There are several subscription services which will hold your medical information and can then be accessed via a unique code you wear on a bracelet or dog tag, but these appear to be US based only and the data held was not in sufficient detail. How feasible would it be to produce a standalone, wearable device? 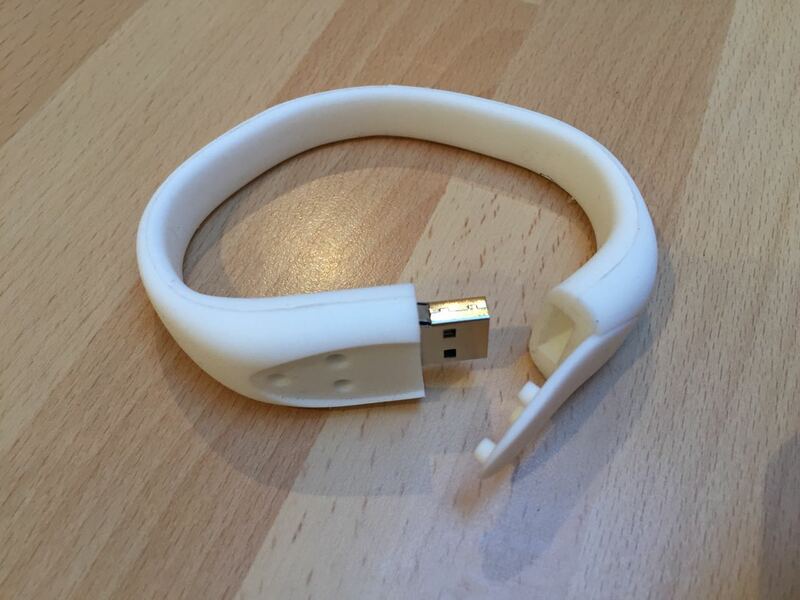 First attempt – using a USB bracelet. First task – decide upon data and format. I settled on two top level documents – i) a simple, overall summary plus ii) a detailed table that recorded each appointment or procedure. These documents were stored as pdf files and linked to various back-up documents such as laboratory or histological reports. The format of the data was such that it would still require a fair amount of time to wade through and understand the aetiology of ,and relationships between, the various LTCs. This was solvable but the second issue would be insurmountable. In order to protect the system from viruses it is unlikely any NHS computer would allow the reading of an external USB stick. Time for a rethink. 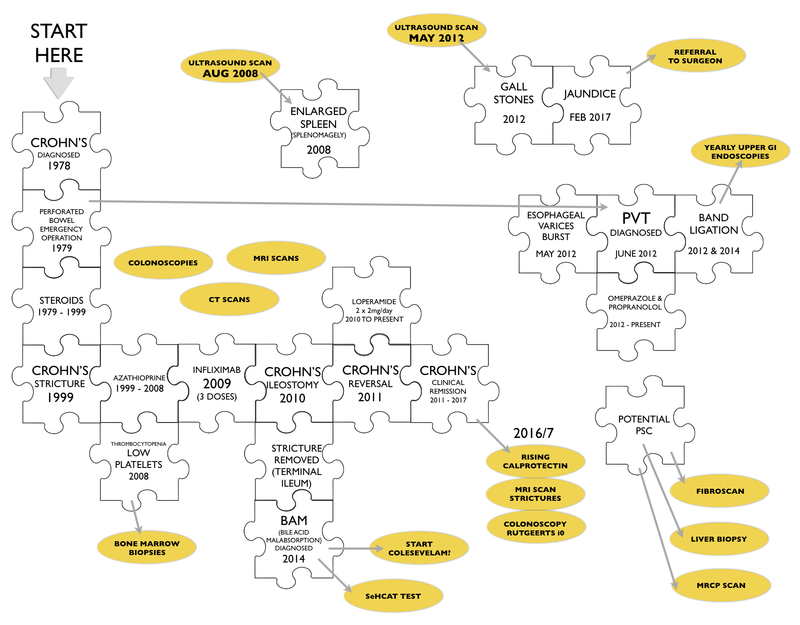 A couple of years ago I drew a diagram to try and understand the aetiology/relationships that I mentioned above. I used the metaphor of a jigsaw as that is how my health appears to me. The penny then dropped that it would be a good way of showing a new doctor or surgeon the complexity of my case on just a single page. This illustration shows an early version of the drawing. 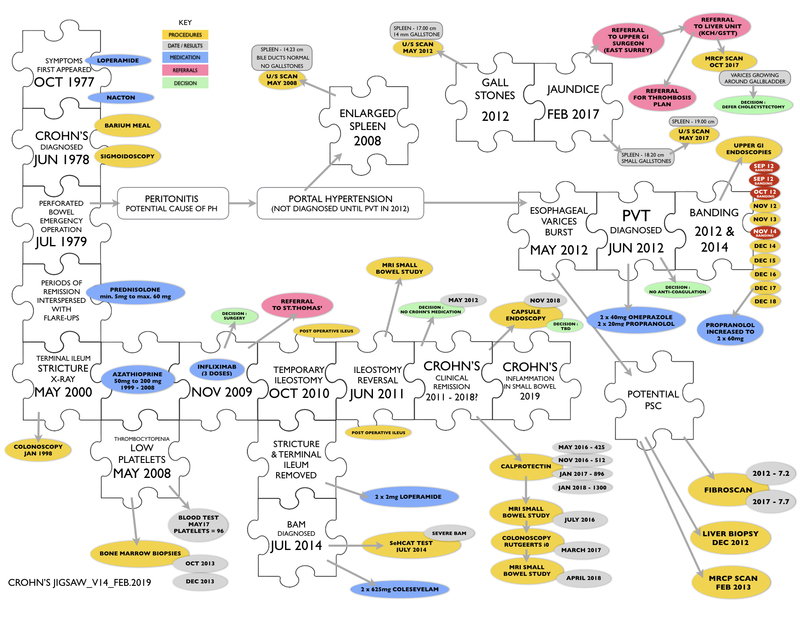 …and then someone set me the challenge of making an interactive version that would open up the relevant documents or test results when you click on an element of the diagram. This would make the ideal interface for my medical record. To get over the USB security problem I settled on holding the data on a server and then accessing it via a QR code. Initially I thought of using a dog tag style SOS pendant with the code engraved on it but I have yet to find a company that can do this as a one-off at a reasonable price. I could use a conventional SOS bracelet with a printed QR code inside but why not try a tattoo? I didn’t want a permanent tattoo as it would not allow for any future changes. I opted to try making a temporary one using those kits that are readily available online. 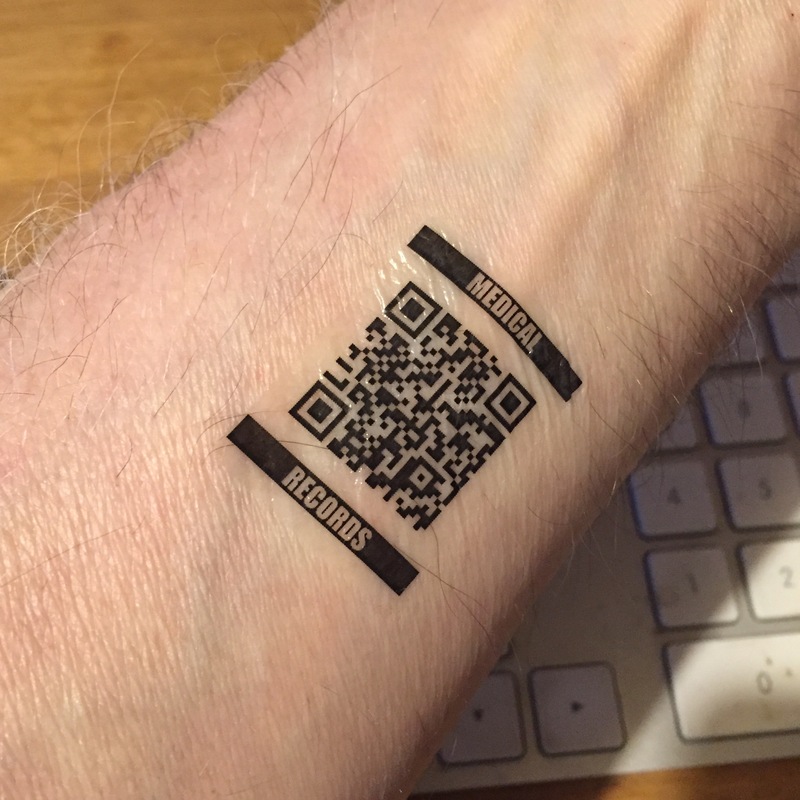 After a couple of false starts, mainly due to not reading the instructions carefully (it’s a man thing), I had a readable QR code tattoo. Where to stick it? The ideal position would be somewhere that is not generally visible but would be seen by an HCP. I chose the inside of my forearm, just above the wrist. Anyone looking to insert a cannula would be bound to see this and hopefully use a phone or tablet to scan the code. Life would be so much easier if the NHS had a universally accessible records system that held all our medical details, linked to our unique NHS patient number (only needs a simple, unchanging tattoo). I can’t see that happening in my lifetime given the success of previous attempts. Clearly I have no issues about the confidentiality of my medical data or I wouldn’t be writing/publishing this post. I know that many patients do and this needs to be taken into account. I am willing to trade confidentiality for the speed at which my medical record could be read should I be involved in an emergency.